After a night of fever, chills and coughing, I resolutely and stoically packed up my bag for today's forced march. Dayton and I shared a tea bag for breakfast (seriously) and started out. It is ironic that after two weeks out in the fresh country air, miles away from any junk food (or sometimes even any food at all) and exercising all day long, I am as sick as I've been for over five years. I've never had bronchitis but I imagine it might sound and feel like this. So take note...get a bag of chips, a glass of wine, sit on the sofa and stay healthy. 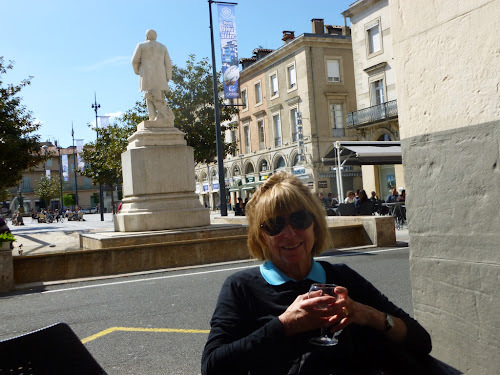 However, the sun came out today and it was a straight four hours into Castres, then almost another hour through to the centre of the city. Being May 1st, a French National holiday, all the stores, restaurants, epiceries and boulangeries are closed. Same as almost every other day but those are called days of rest. Content is a warm croissant. Content is an order of fresh cut fries. Content is a bottle of vin rouge on reserve (3€ 80!). As we finally arrived in the centre of the old town some entrepreneurial vigilantes had opened their stores. We stocked up as if we would never see a store open again buying croissants, bread, cheese, wine, nuts, fruit, drinks and some obnoxious pseudo-meat for Dayton. But I don't judge. We sat in the Place de Saint Jacques and devoured the croissants and banana. One block later there was Shwarma fast food open. Perfect. We went in and Dayton heroically took one for the team. He ordered a steak kebab burger so I could eat the fries that came with it. With my cold I couldn't taste them but I can imagine and I appreciated them so much. We walked by the Musee Goya and its elaborate maze of sculpted gardens and found our gîte. Our hospitalitie greeted me with a sprig of Lily of the Valley flowers, a May 1st tradition and once again, we have our own room, shower and bath. After showers and a change of clothes we went back to the centre ville to explore. Our guidebooks, Miam Maim Do Do (which roughly translates to 'yum yum, night night' because it shows maps and places to eat and sleep) always emphasizes that everything is closed on a national holiday. It neglects to mention that restaurants and bars, especially in bigger towns open so that the locals can sit out, have a glass of rosé or espresso and enjoy the sun. Now we are starting to be ridiculous, incorrigible or gluttonous. We treated every open coffee shop or patio bar as the Last Chance Saloon, a tea and flan here, a glass of rosé there. We indulged like it was our last supper. Thankfully the need for a nap overcame me or we'd still be sitting in the Place Jean Jaurès ordering another. Later at the gîte, even though after our food foray into town we didn't need it, we fixed a dinner of pasta and a vegetable tomato sauce, bruschetta with tomato and chèvre, paired it with a Cabernet Savignon and ate outside in the garden......before the rains came !!!!! !